ROYAL OAK, MICH. (December 18, 2014) – Today, legislative leaders announced a plan to increase road funding and create a new revenue stream for schools. The proposal, funded through a penny sales tax increase, will require approval of Michigan voters through a ballot proposal, expected in May 2015. “Today, our elected leaders proposed a promising plan for Michigan students. If approved by Michigan voters next year, this bipartisan plan would prevent the state from diverting education dollars for roads and would help provide needed investment in school improvement efforts across the state. We’re particularly pleased to hear some resources would be ear-marked for high-need, at-risk public schools. The Education Trust-Midwest is a statewide, non-partisan, education research, information and advocacy organization focused on what is best for Michigan students, particularly low-income, African American, Latino and American Indian students. 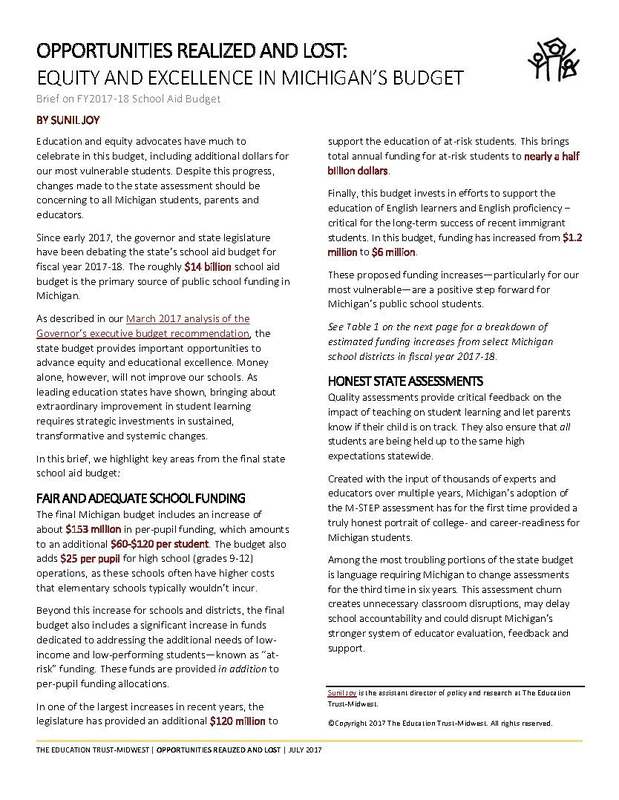 We provide data-driven information and expertise to our state’s families, educators and policy and civic leaders about how to make Michigan a top education state and close our achievement gaps.